In the central part of the coin is shown the stalk of the tobacco in inflorescence. Along the upper edge is written the Croatian name of the plant (DUHAN) tobacco. Along the bottom edge, in the central part, is written the year of minting (1993). Signature KK. 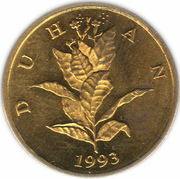 In the central part is shown stylized linden branch in inflorescence and on the leaves is written the value of the coin (10). Under the number is written inscription "LIPA" (linden). 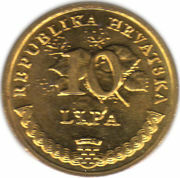 Around the top edge is written "REPUBLIKA HRVATSKA" (The Republic of Croatia). Around the lower edge, in the central part, is the coat of arms of Republic of Croatia. Left and right of the coat of arms is laid old Croatian braided ornaments. 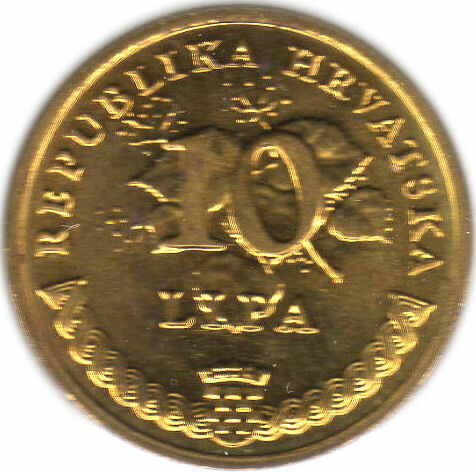 NOTE: The engraver of the coin, Kuzma Kovačić, was distinguished Croatian academic sculptor.